(www.kaieteurnews.com) In light of the fact that there is limited availability of skilled workers, the private sector is gearing to collaborate with the University of Guyana (UG) with a view of deriving a remedial plan. 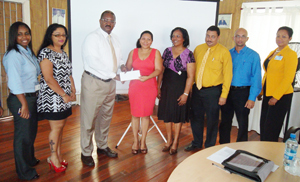 This development was alluded to by President of the Georgetown Chamber of Commerce and Industry (GCCI), Mr Lance Hinds, as he handed over a cheque for $355,000 to University of Guyana’s Director, Centre for Communication Studies, Dr Paloma Mohamed-Martin. According to Hinds, “the private sector is quite short of the kind of skills that it needs so it makes so much sense to sit down with UG and work out how we can solve these problems we have in the sector”. “The private sector will be seeking to have a deeper conversation as well, because of how important the University’s contribution is to skilled Guyanese and human resource development.” It is for this reason, he said, that the private sector is only too willing to sustain its support to the efforts of the University. Hinds in his remarks yesterday thoughtfully highlighted that “there is no question in our minds that the University is a fundamental pillar in Guyana’s overall developmental framework…the University has already made significant contributions to the social, economic and political landscape of this country”. Moreover, the financial donation handed over yesterday comes as part of the private sector’s effort to contribute to the University’s continued celebration of 50 years of existence. According to Hinds, he is hopeful that the next 50 years of the University will be devoid of the challenges that hinder its effectiveness. The donation was made available by 17 private sector companies including: China Trading, Roraima Airways, Grace Kennedy, John Fernandes, Demerara Tobacco, Laparkan Holdings, TSD Regional Management Services Limited, Doerga Business Enterprise, D and J Shipping Service, California Stucco Guyana Inc., Ansa McAl, Caribbean Containers, Rambarran’s Enterprise, Dilip’s Variety Store, Associated Industries and Texila University. Representatives of some of the companies were on hand yesterday to witness the GCCI President hand over the cheque to Chairman of the University’s 50th Anniversary Committee, Dr Mohamed-Martin. The latter was accompanied by Chief Librarian of the University, Ms Gwyneth George. According to Dr Mohamed-Martin, as part of the celebration, which commenced in October of last year, a number of activities have been ongoing and some are yet to unfold. Among these, she noted, will be a coffee table booklet – a pictorial history of the University over the past 50 years. The proceeds of this booklet’s sale, she noted, will feed into the University endowment fund. “The University of Guyana, unlike many other universities in the world, has no endowment fund, and so if you want to do something big like create a library or to build a students’ centre or something, the funds have to come from the operational fund, and that does not work well because there is competition for that fund,” Dr Mohamed-Martin explained. “We are very grateful,” Dr Mohamed-Martin said of the donation yesterday. The year of celebration for the University will come to an end this October and, according to her, “what we want to do is to leave a legacy for other years, so the endowment is going to be launched with the publication of the booklet…we are hoping to raise about 10 million from the sale of the books”. According to the Communications Director, the University will also be looking to further collaborate with the private sector to secure members outside of the tertiary institution to manage the endowment.